While the gaming world has been getting swept up in the heat of battle royales and the like, some gamers may have forgotten that the remastered version of Assassin's Creed III is set to arrive next week. That's right, less than a week remains before players will be able to enjoy the adventures of Connor during 18th-century America once more, but in glorious remastered fashion. That said, Ubisoft has officially unveiled the PC specs for the upcoming remaster, and it's looking like non-console players won't have to have the greatest hardware to enjoy the experience in HD. 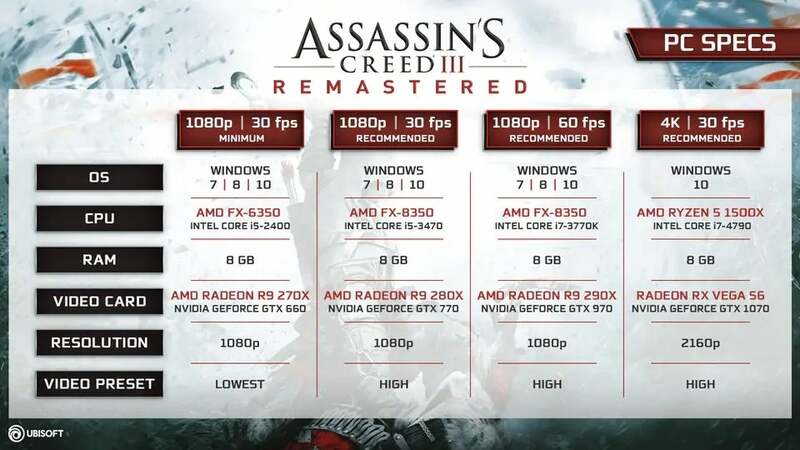 Taking to their website, Ubisoft released a helpful image that breaks down what PC players will need in order to run the Assassin's Creed III remaster. The minimum for those aiming for 30 FPS at 1080p will need at least an AMD FX-6350 or Intel Core i5-2400 as well as 8 GB of RAM and an AMD Radeon R9 270X or Nvidia GeForce GTX 660. For those looking to get the most out of the remastered experience, however, 4K support is available. In order to achieve 4K resolution at 30 FPS, it is recommended that players have at least a Ryzen 5 1500X or Core i7-4790, 8 GB of RAM, and a RX Vega56 or GeForce GTX 1070. Of course, every player's hardware will be a bit different, especially when it comes to other variables such as RAM type and speed. Thankfully, it doesn't seem like the remastered Assassin's Creed III will require the latest and greatest specs to get it running on PC. We'll just have to wait and see how well it actually performs when the remastered Assassin's Creed III launches on March 29th for PC, PlayStation 4, and Xbox One. Nintendo Switch players will have to wait until May 21st to play it on the portable console. What do you think about all of this? Excited for the Assassin's Creed III remaster? Will your PC be able to handle the upcoming game, or will you have to enjoy the journey on console? Sound off in the comment section below, or feel free to hit me up over on Twitter @anarkE7!